Information regarding each numbered building is listed below the map. 1. Headquarters: This building has served downtown Roseau as a cigar factory, business office, and here at the Farm as an office. Step inside for a look at dental equipment used before 1969. 2. Ross Post Office: This restored post office was the third post office established in Roseau County. You will see old post office boxes and an old-time telephone switchboard. 3. Ross Hartz Store: This first Hartz store established out of Roseau in the Hartz chain served it's constituents well until 1968. Take time to observe the old counters, prices on display items, old cash register, and even an antique machine to give hair permanents. 4. Print Shop: The print shop was constructed on the farm in 1985 with material salvaged from Roseau County Fairgrounds barns. Imagine publishing a newspaper using the equipment on display here, including a linotype. 5. Pioneer Lunch Stand: Originally the on-site home of the Farm caretaker, this building is constructed from old salvaged material. Moved from the west side of the Farm to the east side it now serves as a food stand. Light lunches are served on special occasions. 6. Nannestad Parish Hall: The Parish Hall was gifted to the Farm by the Nannestad Church Congregation in 1985. It serves as a great gathering and eating place for Pioneer Farm events. Note the tables, benches, and creaking chairs. 7. Casperson School from Wannaska area: As you look at this building, you will notice it is constructed with logs and stucco. Records indicate it served as a school for 38 years. Inside are many items typical of the early 1900's. 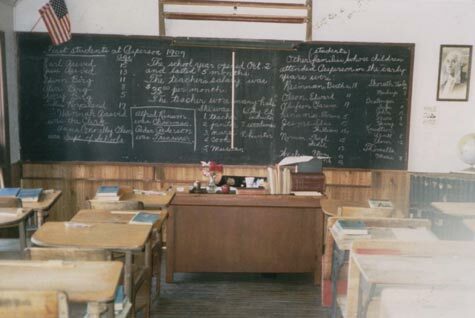 You may want to check the listing of teachers from that era on the school's blackboard. 8. Nannestad Church: Construction of this church, located seven miles southeast of Badger, began in 1902. Gifted to the Farm, it was moved to its present location in 1983. Church records and many furnishings are inside for your viewing pleasure. The organ is in working condition. The Farm is pleased to have had many special events occur in this church which celebrated its 100th anniversary in 2004. 9. Mostal Barn: You are looking at an example of the early "hip" style barns built in the late 1800s. The barn was built from logs and in sections. Imagine moving this large building to the Farm. Records indicate the only thing holding the sections together was the roof. The inside of the building is not open to the public. 10. Blacksmith Shop: Most early pioneer farmers had to make, fix, or repair their own machinery. Housed in this building are a forge and other blacksmith equipment. A visit during the August Fall Festival will give you the opportunity to witness a demonstration. 11. Museum: Needing a place to store things, this structure was built on site. As you enter you will notice "stalls" filled with neatly organized artifacts. The Farm is very proud to have turned a storage building into a fine museum. 12. Audrey's Playhouse: This log playhouse was built in the mid 1920's. Donated to the Farm in 2004 it is being refurbished by Pioneer Farm volunteers. You may be surprised at what is inside. 13. Halvorson House: A log house which was home to a husband and wife and eight children. It is a fun house to visit as it contains many items used "way back when." During the Fall Festival you may even get a chance to visit with a family member at this house which marked its 100th anniversary in 2005. 14. Holm-Bjorkman Exhibit Hall: One of the more recently constructed buildings on site is this large exhibit hall. You are encouraged to step inside. An original 6'x24' permanent art mural entitled "Rural Life - Once Upon a Time" will catch your eye. Look for familiar names on the impressive boardwalk around the interior of the building. You will also find old tractors, wagons, buggies, and a snowmobile to catch your interest. Walk through the Trapper's Cabin. It was the first old building placed on the Farm and was used for ticket sales and pelt displays at the gate before being moved inside to shelter it from the elements. 15. 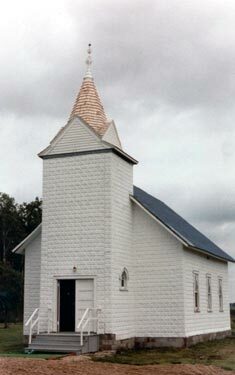 Pioneer Church: Visit the oldest church building in Roseau County. It was used as a church approximately 14 years. View the unique furnishings and read about its history. Restoration is being done by the Roseau County Historical Society. 16. Grothem Amphitheatre: Built in 2002, this project creates a natural amphitheatre effect. Entertainers enjoy the protection from the elements and the audience can sit in the shade of the mature oak trees. 17. 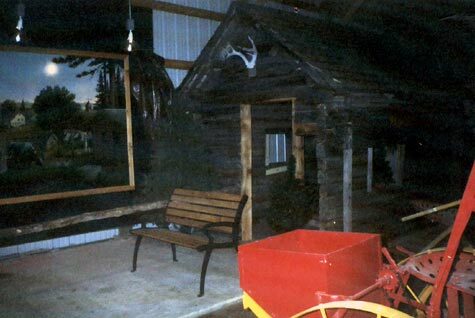 Brekke Log Cabin: Added to the Farm in 2003, this building has served as a guest house and cabin and was moved to the Farm from Rocky Point. Don't miss the Log Cabin Creations Gift Shop inside.